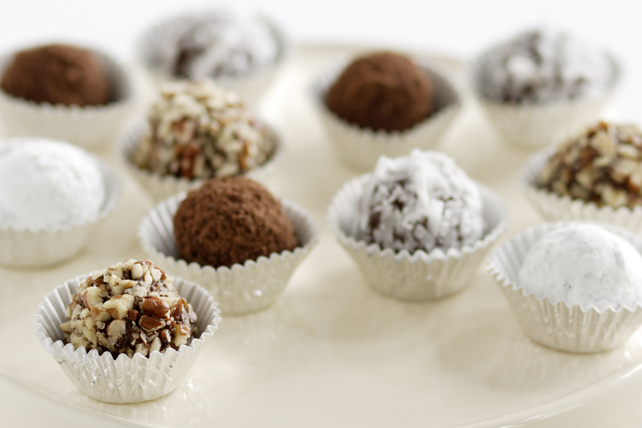 Ultra decadent and so easy to make, these bite-size treats are made from just four ingredients. Roll them in your favourite sweet coatings and you’ve made an impressive goodie to share. Microwave chocolate in large microwaveable bowl on MEDIUM 2 min. or until chocolate is almost melted, stirring after 1 min. ; stir until completely melted. Stir in peanut butter until well blended. Cool to room temperature. Gently stir in Cool Whip. Refrigerate 1 hour. Roll into 26 (1-inch) balls, using melon baller or teaspoon to measure each portion. Roll in sugar until evenly coated. Keep refrigerated. This delicious recipe is intended for special occasions. Be sure to keep portion size in mind - each serving is 2 balls. Roll balls in finely chopped pecans, toasted flaked coconut, grated Baker's Semi-Sweet or White Chocolate or finely crushed Nilla Vanilla Wafers instead of the icing sugar. For best results, make sure the chocolate mixture is at room temperature before adding the Cool Whip. For easy rolling of the balls, refrigerate chocolate mixture 1 hour as directed. If the chocolate mixture gets soft while rolling out the balls, return it to the refrigerator, or pop it in the freezer, until firm.